After the release of the University Blue-Flint Grey colour of the Air Jordan 13 retro, the fourth of five instalments this year is set to hit the market this weekend, Sunday 12 December. The new Air Jordan 13 Retro will be released in a stunning Black/Altitude Green colour, which will be the first of its kind, having black-coloured upper part with an Altitude Green sole. The new colourway and unique design of the new AJ13 also possess the comfortable feel of the original and previous releases of the shoes. The Buzz around the sneackers’ world is that Jordan Brand will just release this as limited editions so do not miss it! 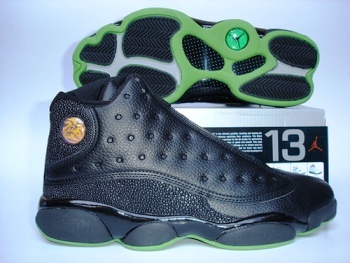 Grab one this weekend, or you will definitely miss one of the best Jordan 13’s ever.